Timeless design and first class performances made the Olympus Mju series to the world's best selling line of cameras ever. Since the introduction of the first 35mm camera in 1991, almost 26 million pieces are sold of analogue and digital models from this camera family. Anticipating with the fast spreading of digital camera technologies, Olympus is now introducing the successors of the two Mju Digital models that appeared on the market in 2003. The Mju 410 Digital features the same smooth elegant lines and weather resistant (weather resistant according the IEC-standard 529 IPX4) metal body, but distinguishes itself at the same time by a new look and an important technical innovation: TruePic Turbo. This new image processor enhances brightness, contrast and colour saturation for even more true to life images. In addition, it processes the image data some 30% faster. Combined with the fast start-up time it means even more decisive shooting. The Mju 410 Digital has a silver/anthracite finishing touch and will undoubtedly develop as an example for the modern style seeker. The reputation of high quality the Mju family built up in the course of years is also visible on this new model. Beside a resolution of 4 million pixels, the camera is equipped with a 3x optical zoom, (equivalent of 35 -105mm on a 35mm camera) which is specifically designed for a CCD (image chip). The latter offers high quality images that even convince at an A4 print due to their sharpness. Thanks to the support of the PictBridge standard, printing is a piece of cake. Using a compatible printer, like the Olympus P-10 Dye-Sublimation printer, which guarantees high quality and durable prints, you don't even need a computer anymore. Thanks to the enhanced automatic functionality en Scene Programs, the camera can do the job whilst the user concentrates on the image composition and obtain fantastic results. Beside the freely selectable Program function the Mju 410 Digital offers eight Scene Programs: Portrait, Night View, Self Portrait, Landscape, Landscape with Portrait, Snow and Beach, Kitchen and Interior, for direct use in a number of specific recording circumstances. In addition, a Movie with sound function is also built in, so the images can be enlivened with movements if required. The length of the movie depends on the capacity of the used xD-Picture Card. On the rear of the Mju 410 Digital a 1.5-inch LCD monitor is found with 134.000 pixels ideal for image framing and direct judgement of the results. The advanced optical-digital technology is protected by a weather resistant metal housing, so you can go on taking pictures under all circumstances even when it's pouring down with rain. 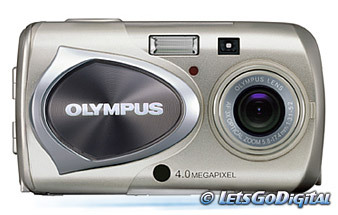 The main features of the Olympus Mju 410 Digital are: 4 million pixels, weather resistant metal housing, TruePic Turbo image processor, 3x optical zoom, (equivalent of 35 - 105mm on a 35mm camera), f3.1 - 5.2, Very fast start-up time and very short shutter release time lag, 8 Scene Programs (Portrait, Night View, Self Portrait, Landscape, Landscape with Portrait, Snow and Beach, Kitchen and Interior) Movie recording function with sound, 1.5 inch LCD with multi-lingual menu, PictBridge support.